The Bellrose Bike-A-Thon is a beloved annual event in St. Albert. Each year, on the first Wednesday in March, a plaid-clad bagpiper leads a steady stream of excited students into the cafeteria of Bellerose Composite High School, where posters with catchy team names hang above and stationary bikes sit in waiting. This annual scene is all a part of the official opening ceremony for Bellerose’s annual 48-hour Bike-A-Thon. 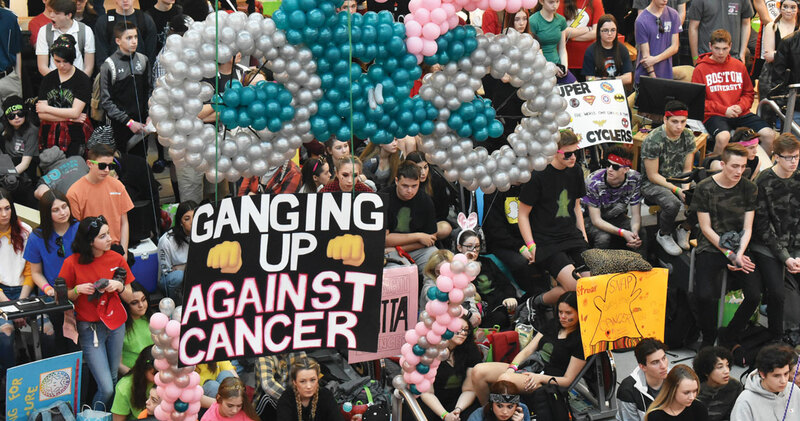 The biggest event of the year at the St. Albert school, the Bike-A-Thon brings students and faculty together to raise money for cancer research and care. Students sign up in January as teams of 10 to 12, and each team must raise a minimum of $1,500 to take part. They fundraise through bottle drives, bake sales and selling homemade items like badges in front of local grocery stores. They also ask for pledges, creating their own pledge pages through the Alberta Cancer Foundation website. Then, during the event itself, students ride for 48 hours on those stationary bikes in the cafeteria, taking one-hour shifts among team members. The determined bikers are kept entertained by live bands, movies, competitions and even a hypnotist. The Bike-A-Thon began in 2004 and was kickstarted by Sue Leighton — a social studies teacher at Bellerose and the event’s coordinator — as well as her teaching partner, Dawn Rothwell, and five other staff members. Leighton and Rothwell had joined a Cops for Cancer triathlon team and were brainstorming ways to raise money. Inspired by a bike-a-thon fundraiser they’d heard about at another organization, they decided to take the idea to the school — and a legacy was born. Bellerose’s very first Bike-A-Thon had 10 teams (approximately 90 students) participating. Now, there are around850 students and staff who take part each year. Since the event’s launch in 2004, the students of Bellerose have peddled enough kilometres to travel approximately 17 times around the globe, and have raised more than $2.4 million for cancer research, with the majority of these funds being directed toward the Alberta Cancer Foundation in support of the Cross Cancer Institute. These funds have allowed the Cross Cancer Institute to not only deliver specialized care to those facing cancer, but also to continually push the pace of discovery with cutting-edge technologies and research that provide real-life returns for Albertans. The 2019 Bellerose Bike-A-Thon will take place from March 6 to 8.